Preheat oven to 400 degrees F. Line large baking sheet with parchment paper, set aside. In medium saucepan combine water, butter, sugar, salt. Bring to a boil over medium heat. Add flour all at once, stirring vigorously with a wooden spoon. Cook and stir until mixture forms a ball and pulls away from the side of the pan. Remove from heat, cool for 10 minutes. Add eggs one at a time, beating well with a wooden spoon after each addition. Drop 8 heaping tablespoons of dough 2 inches apart onto the prepared baking sheet. Bake 30-35 minutes or until golden brown and firm. Transfer cream puffs to a wire rack, let cool. 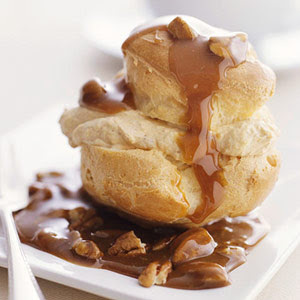 Using a serrated knife, cut each cream puff in half horizontally, remove soft dough from inside. Fill cream puffs with Pumpkin Mousse, replace tops. Spoon some of the warm Maple-Caramel Sauce onto 8 dessert plates, sprinkle with toasted pecans. Place a filled cream puff on top of sauce on each plate, drizzle each cream puff with remaining sauce and sprinkle with remaining pecans. In a chilled large mixing bowl, mix whipping cream, sugar, spices with chilled beaters of electric mixer on medium speed until soft peaks form. Fold in canned pumpkin. Cover and chill for up to 4 hours. In small heavy saucepan, stir together brown sugar and cornstarch, stir in cream, water, maple syrup, butter. Cook over medium heat until slightly thickened and bubbly, stirring constantly. (Mixture may appear curdled before it bubbles.) Cook and stir for two minutes more. Remove from heat, stir in vanilla. Serve warm. To make ahead: Prepare as above through baking cream puffs. Layer between sheets of waxed paper in an airtight container. Cover and chill for up to 3 days or freeze for up to 3 months.